It doesnt matter if this is the first time you are trying to learn which type of crafts make the best as your home decoration, this guide will help you to get on a right track to a fun-filled festive fall. Do you or someone you know want to really decorate up for Thanksgiving this year? If so, pay close attention! There is finally an original new book created just for people like you! And, if you really want to know the facts about Thanksgiving crafts, this book is definitely for YOU! This is not Like Some Useless Guides On Crafts That You Can Find In Any Store.. This book covers everything there is to know about Thanksgiving Crafts and its understandable to the average person! In fact, some people have called it the Thanksgiving Crafts Secrets Recipe! Its like having your very own crafts expert that you can reference and ask questions anytime you need to! You will uncover a wide array of tips, including using household items to begin crafting today! I myself love Thanksgiving. I host the dinner every year and wanted to make it more festive with some easy decorations! It was not easy when I first started out! I mean, information on Thanksgiving crafts is not easy to come by... I wanted more than straw and pumpkins. To be quite honest with you, I got tired of looking and searching all over the place, so I decided to create this definitive book on Thanksgiving crafts! Youre going to discover so many things on Thanksgiving crafts with little effort! Not only will you discover the ease of getting started, but you will also learn extra bonus tips to actually show others, too. * Discover Why We Celebrate Thanksgiving. * Find out how to Make Pilgrim Hats. * Learn the Thanksgiving Story. * Discover how to make Indian Headbands. * Discover Other Pilgrim and Indian Crafts. * Find out about Turkey Crafts. * Discover Pine Cone Turkeys. * Learn how to make a Handprint Turkey. * Learn how to make Thanksgiving centerpieces. * Learn about Thanksgiving Wreaths. * Discover Thanksgiving Place Cards! * Learn to make Placemats. It doesnt matter if its 2 AM on a Sunday, you will be downloading and reading Definitive Guide To Thanksgiving Crafts - Learn How To Decorate Your Home For A Festive Fall Season within just a few minutes. There is absolutely no risk to you - so what are you waiting for? Order now! And this is not one of those books in codes where you dont understand whats being said. Everything is in plain English, so you can put the translation book away :) This easy to read book on making crafts for your thanksgiving festive fall season are completely comprehendible and wont take weeks to read through. 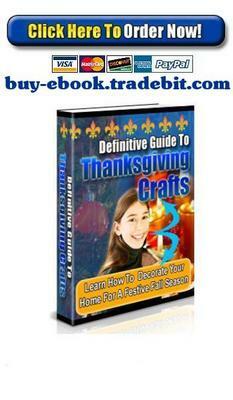 Definitive Guide To Thanksgiving Crafts - Learn How To Decorate Your Home For A Festive Fall Season normally sells for $74.00, but as part of my Finally getting this on the Internet sale, I am willing to give you an instant very heavy rebate.. So, you can get your own copy of my Definitive Guide To Thanksgiving Crafts - Learn How To Decorate Your Home For A Festive Fall Season for only $1.99!